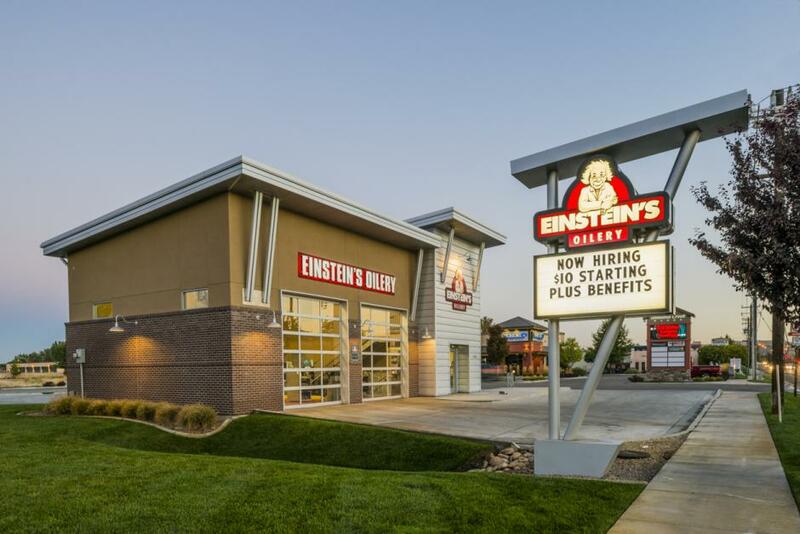 Project Highlights: This particular project is located on Glenwood Street directly across from the Boise Hawks Baseball Stadium in Garden City. The building square footage is approximately 1800 SF and includes a basement or pit for the crew to change vehicle oils and fluids. The parent parcel was 0.49 acres in total area of which 0.18 acres were dedicated for the Einstein’s facility. The most significant challenge on this site was high groundwater. The parcel is situated just south of the 100 year flood zone line and local test holes indicated ground water would be encountered at 3’-5’ below existing ground surface. Because of state DEQ separation requirements for water quality, the site had to be raised anywhere from 1’ to 2’ and designed to accommodate and dispose of storm water via five infiltration ponds spread around the site rather than utilize a typical single deep infiltration trench. Pumping of groundwater was required for construction of the sewer service as well as for setting the concrete foundation for the basement. Other challenges included designing curb, gutter and sidewalk to match Glenwood Street, an ITD arterial, which had several ripples along its edge of pavement. Matching into existing pavement along the north boundary at the site entrance and exit proved difficult and thus concrete valley gutter had to be utilized to create a smooth transition. Due to the winter timeframe of the project the client and contractor opted to utilize concrete rather than pavement for the drive aisles. The project civil engineering plans consisted of a topographic survey, horizontal control plan, grading and drainage plans, utility plans (sewer, water, and storm drainage), plan/profile street plans for Glenwood Street and an Erosion and Sediment Control Plan. The agencies involved were the City of Garden City, ACHD and ITD.